Here I go again with the embellishing rampage! 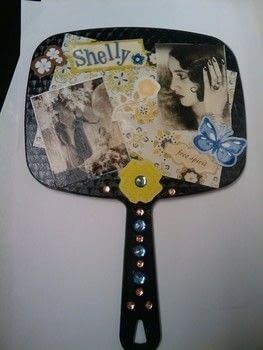 This time it's a handheld mirror that I decorated for my friend Shelly. Hand Mirror Mod Podge Scissors Sponge Brush Magazine(s) cutouts, wrapping paper, tissue paper, ribbons, scrapbook paper, stickers, jewels, rickrack, acrylic paint and brushes, spray paint, etc. 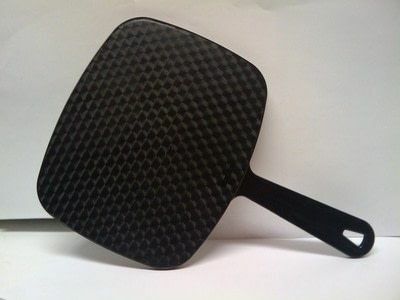 + Hand mirror, any size. Can find them fairly cheap at drug stores or dollar stores. +Magazine cutouts, wrapping paper, tissue paper, ribbons, scrapbook paper, stickers, jewels, rickrack, acrylic paint and brushes, spray paint, etc. I used some photos of 1930s fashion photography printed on matte cardstock. The background paper, stickers, and jewels are from a scrapbook kit. Those are so nifty. Cut out images and lay them out so you know how you want the final product to look. 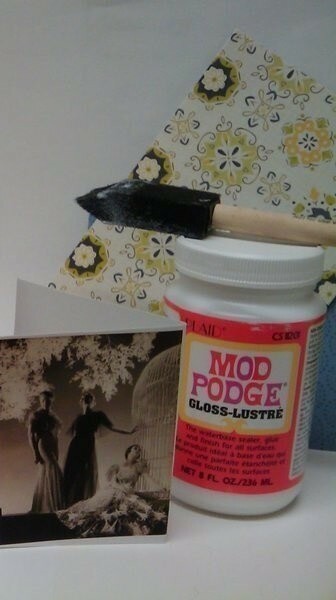 Glue the images to where you want with decoupage glue. Make sure you get the air bubbles out by smoothing out the picture. Wait for the decoupage glue to try for a bit (minimum of half an hour) before applying a coat all over. Wait an hour for it to dry, then apply another coat. It should dry within an hour. If you want to add any jewels or ribbons, wait for the initial overcoat to dry then add them. Put another coat of the decoupage glue all over, including the jewels.